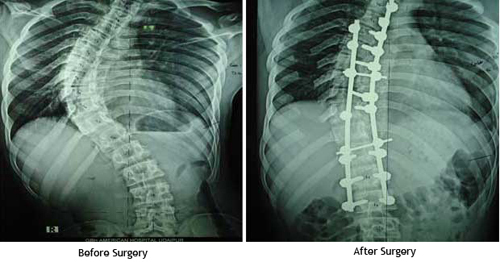 Save a child trust works for children affected from Spinal Deformity (Mainly Scoliosis). The initiative for this project has been taken by Dr. Kirti K. Jain (CMD, GBH American Hospital) and Dr. Chirayu Pamecha (Spine Surgeon). The trust has been formally inaugurated by Shree Ji Arvind Singh Ji Mewar on 26/09/20069, at Durbar Hall, City Palace, Udaipur. SACT is committed to the idea that every child—regardless of gender, religion, caste, color or financial situation—deserves world-class medical treatment. The trust works through voluntary donations received from various donors. Since inception, over 300 children have been examined under the trust activities and 7 children with complex spinal deformities like scoliosis and kyphosis were operated. A free spinal clinic is being run on every Tuesday and Thursday between 3-5 PM at GBH American Hospital, Udaipur.